Welcome to CoastersForLess.com, your one-stop-shop for all of your custom printed coaster needs. 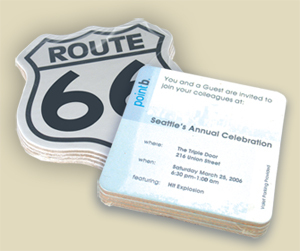 Coasters are a must for any party or event, promotion, fundraiser, restaurant, bar, lounge, school, company or club. Several fortune 100 companies are among our thousands of clients. Because they are inexpensive and desirable as “keepsakes” and disposable, they are a great way to send your corporate logo home with customers. Custom Printed Coasters from CoastersForLess.com come in many sizes, shapes and types. Because we care about our environment, we offer printed coasters manufactured from biodegradable, environmentally friendly card stock, pulpboard, cork, rubber and fabric. Our state of the art printing methods insure accurate designs that are printed using environmentally safe products. And, the most important FREE feature of our company is the fact that when you call our Toll Free number or email us, you will be in contact with a LIVE, trained representative. You will receive a full color design proof of your custom printed coaster usually within an hour of your request and our representatives are in our office to assist you in any way possible so that your buying experience is nothing less than pleasant! Please browse the very informative pages of our website and give us a call on our TOLL FREE number at 866.291.1815 or email us through our FREE QUOTE page or at Sales@CoastersForLess.com where one of our talented associates is waiting to assist you now! Contact CoastersForLess.com For Custom and Affordable Coasters Of All Kinds!